BLACKSBURG, VA. – No. 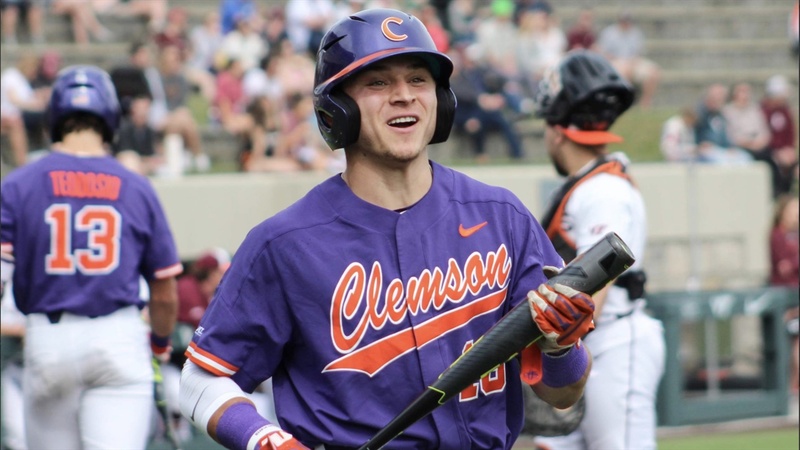 15 Clemson scored four runs in the second inning and broke the game open with seven runs in the sixth inning to defeat Virginia Tech 14-1 at Union Park on Saturday afternoon. The Tigers (21-6, 8-3 ACC), who took a 2-0 lead in the series, jumped on the Hokies with four runs in the second inning. Three straight run-scoring doubles by Bryar Hawkins, Bo Majkowski and Davis Sharpe along with a run-scoring single by Elijah Henderson plated the runs. Virginia Tech (16-11, 4-7 ACC) got on the scoreboard in the fourth inning on Dalton Harum’s sacrifice fly. The Tigers responded with two runs in the fifth inning, then they exploded for seven runs in the sixth inning, highlighted by Kyle Wilkie’s run-scoring double, Sharpe’s two-run single and Bryce Teodosio’s three-run homer, his seventh of the season. Clemson added a run in the seventh inning on Majkowski’s run-scoring single. Clemson totaled 13 hits, but Logan Davidson’s 14-game hitting streak came to an end. Clemson starter Mat Clark (6-0) earned the win by allowing just two hits, one run and three walks with three strikeouts in 6.0 innings pitched. Hokie starter Peyton Alford (1-3) suffered the loss, as he gave up four runs on three hits in 1.1 innings pitched. The series concludes Sunday at 1 p.m. on ACC Network Extra.